Wander into the Pokémon Center in Celadon City, and, in Pokémon Let’s Go, Pikachu! and Pokémon Let’s Go, Eevee!, you can meet the Fortune Teller, Madam Celadon. For the first time in the series, the Fortune Teller presents players with the chance to control the Nature for any future Pokémon that they encounter. After asking whether she should foresee the Nature of fateful Pokémon that you are yet to meet, the Fortune Teller will ask you to part with 10,000 Poké Dollars before letting you know your fate. Of course, there has to be some air of mystery about it all, and you will have to answer two questions. 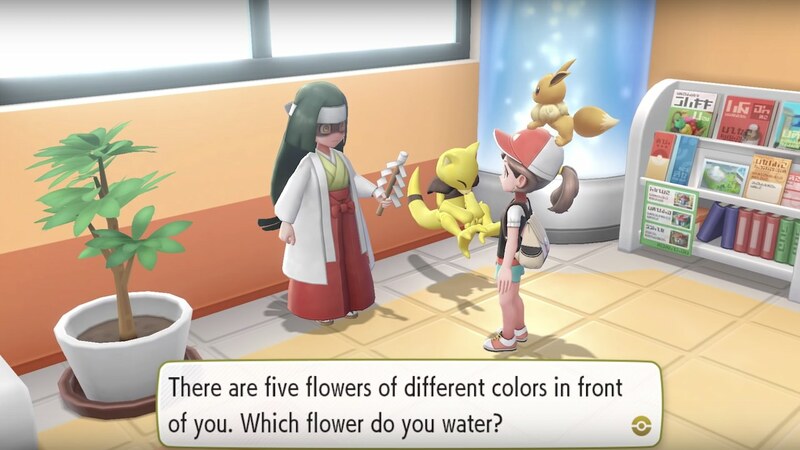 You will first be asked which colour flower you want to water and the second question will then ask which flower you want to thin out. These colours relate to particular stats, whether that be Red (Attack), Yellow (Defense), Blue (Sp. Atk), Green (Sp. Def) or Pink (Speed). The different colour combinations that you choose to water and thin out will let you determine which Nature, and, despite how unhelpfully vague it all is, we’ve broken down everything to help simplify it.